Here's a funny layout of my son during his 'cupcake making' phase. He used to 'make' a cupcake using a sofa cushion, his sisters tricycle and a blanket! And a very gaudy colour combination too, which was challenging! It was such a quirky and funny little phase he went through that I'm glad I did a layout about it to remember for years to come. Kids are so cute! The font is from Cricut cartridge 'Hello Kitty font' and the cupcake from 'Celebrations'. I punched holes around the three featured circles and place coloured paper behind them to match the colour of the patterned paper. Check out the other yummy creations at Cooking with Cricut for their Cake, cupcake or teddy challenge. I think this may seriously be the cutest thing I have ever seen! How creative (and adorable!) is your son?!!! Love it. :) And I love how you so perfectly captured the cuteness in your layout! Thanks so much for joining us at Cooking With Cricut this week. 2 adorable! Thanks for playing with CWC! 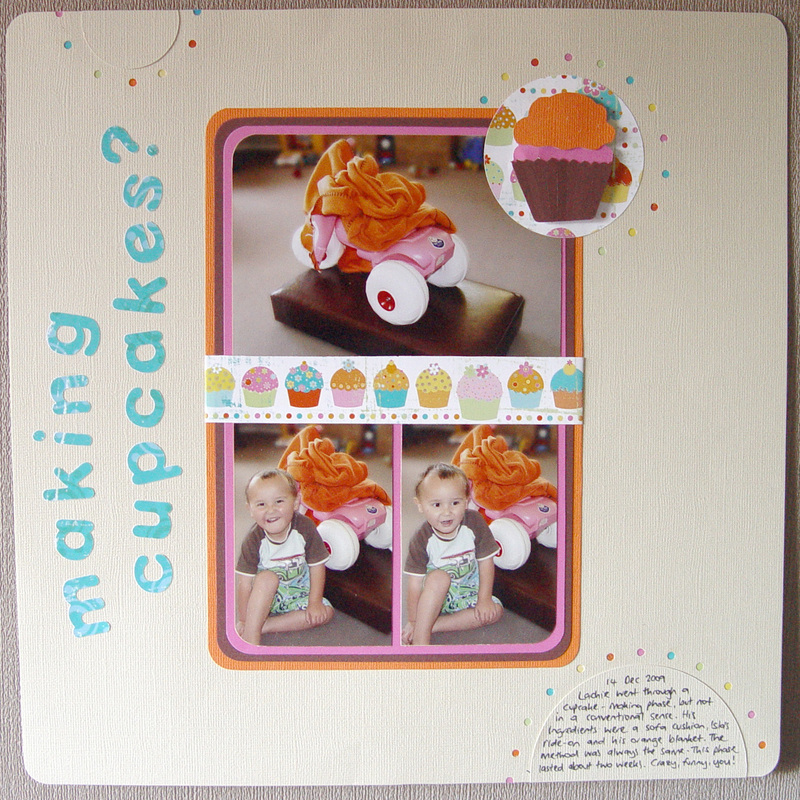 Love this layout - what a cute memory to scrapbook, one that will make you smile everytime you see it. I really like the idea of the punching the holes around your image, great idea - will have to try that on some of my layouts. Thanks for the inspiration and joining us on CWC. What a cutie! And what a wonderful LO to capture this precious memory! Thanks for linking up at Cooking With Cricut this week. The dots just make this and I love it! This is just precious!!! Thanks for joining CWC. those little holes look like sprinkles... what an awesome idea! thanks for playing w/ us at CWC. I love love love this layout! 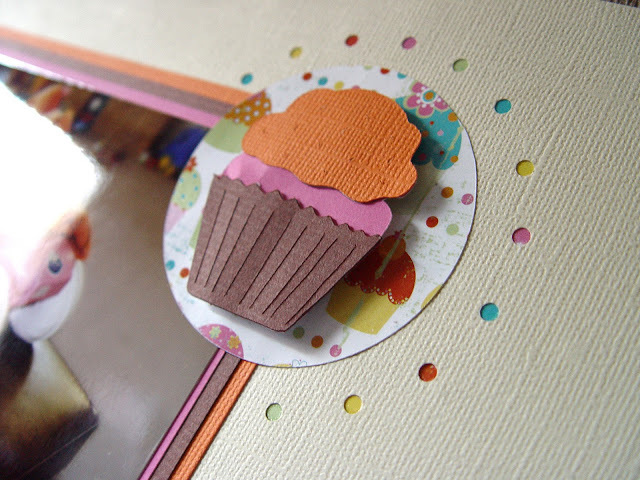 Love the hole punch idea, love the cupcake, love the colors, love the adorable pictures . . . love the layout! Great job! Thanks for joining us at Cooking with Cricut this week. Beautiful, love the punched holes!